In an attempt to improve student decision making and analytical skills, the use of simulations and gaming has emerged as a valuable experiential pedagogical tool. The primary objective of a simulation is to offer students an opportunity to explore multidimensional decision making using real life business scenarios. According to Cadotte (1995), “A simulation is an experimental learning exercise in which students practice the design, implementation, and control of business strategies…The paramount objective is to help students internalize business thought through the practice of busi-ness decision making.” Most authors make a clear distinction between simulations and gaming. Cruickshank (1977) defines simulations as, “the result when one creates the appearance or effect of something.” Games, on the other hand, “are contests in which players and opponents operate under rules to gain a specific objective.” (Cruickshank 1977) Today two types of simulations have developed in academia: simulation games which endeavor to create realistic models of certain business sectors and non-simulation games which are hypothetical competitions with limited scope. Justification for the use of simulations as a pedagogical tool can be found in many studies. As an experiential learning tool, simulations generate student interest beyond that of the traditional lecture format (McKeachie 1986). Empirical evidence suggests that simulations enrich the learning environment, not only of course material, but they improve the learning process in the classroom. (Drea, Tripp, and Stuenkel 2005; Allery 2004) As an example of active learning, studies show that simulation education empowers students as participants in the learning process, rather than treating them as “passive receptors of information” (Drea, Tripp, and Stuenkel 2005; Becker and Watts 1995; Johnson and Johnson 1989). James Stice (1987) found that students retain 10% of what they read, 20% of what they hear, 30% of what they see, 50% of what they see and hear, 70% of what they say, and 90% of what they do and say together, especially through role playing and simulations. His advocacy for active learning is mirrored by several authors, including Becker and Watts who believe this type of educational method is beneficial to the development of problem-solving skills, critical thinking, and general attitudes towards the course (Becker and Watts 1995; Johnson and Johnson 1989). The purpose of this study is to analyze the impact on student learning of a marketing simulation game. Further, it will investigate the effects of simulations on the general learning objectives of a music marketing course. The discussion briefly reviews concepts of simulation, before reviewing the survey results and presenting solutions from the findings. analysis, research, and develop marketing strategies applicable to the music industry. To achieve the course objectives, students participated in three interconnected simulations. The first was the creation of a music marketing plan. This simulation formed the basis of the second stage, a detailed advertising campaign. Finally, a focus group simulation evaluated the advertisements from the previous simulation. Assessment for the simulations was evenly distributed (30% per simulation) with case study readings and class participation comprising the remaining 10% of the course grade. The simulation grade was divided into two portions: the simulation (80%) and a peer evaluation (20%). The simulation occurred over a fifteen-week period. Students were organized into eight groups of six members.3 Each group member was assigned a role within his or her “company.” It was expected that the group elect a president and vice-president to manage the overall group performance and creation of the appropriate documents. Students assumed roles based on their personal interests and skills. For example, many of the students who had completed accounting took control of their group’s finances. Group members were selected randomly and rotated at the conclusion of each simulation to allow for the deepest possible learning experience. Each group was in charge of making decisions regarding pricing, marketing forecasting, product focus (whether to emphasize the high- or low-end product), and overall management. Variables such as location, media vehicles, and document structures were determined ahead of time. Due to the complexity of marketing and the high number of variables, each group had to follow strict guidelines (the so called “rules of the game”) in developing its marketing documents. In the marketing plan, students were required to identify the potential market for their chosen music product, describe the target market, analyze the general environment, and create an action plan. The advertising campaign required students to create advertisements for multiple media outlets. The final simulation required the groups to test the marketing campaign’s effectiveness via focus groups. Each group gathered members of the marketing plan’s target market to test the advertising examples. Ground rules for each simulation were set out in several documents, which acted not only as guides, but assisted students in the development of the documents. Each document gave a hypothetical example from which groups could reference their own simulations, resource links, and information pertinent to the simulation. To enhance the critical thinking component of the simulation, all students were asked to turn in weekly reports that clearly detailed what had been achieved within the timeframe, why they had made various decisions, and the extent of their progress. This gave the professor the opportunity to control the flow of the simulation, correct inaccuracies in the application of theory, and resolve any group issues that may have arisen. Although the simulation was the primary vehicle for investigating marketing principles and assessment, the lecture method remained the primary method for disseminating information. Each lecture was built on the corresponding stage of the simulation. Case studies were used to highlight the concepts and problems associated with various simulation sections. Each group met at the conclusion of each lecture or on its own time during the semester. At the conclusion of each class, the topic material was incorporated into the group discussion and project development. The course made use of Blackboard, a virtual learning environment that allowed extra material, communication, and discussion forums. 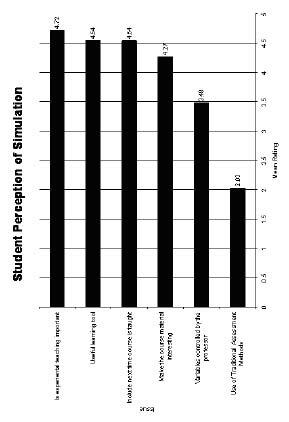 A survey (figure 3) was conducted to assess the impact of the simulations on student learning and how well the simulation met the course objectives. Of the 49 students enrolled in the course, 39 (80%) returned the survey. 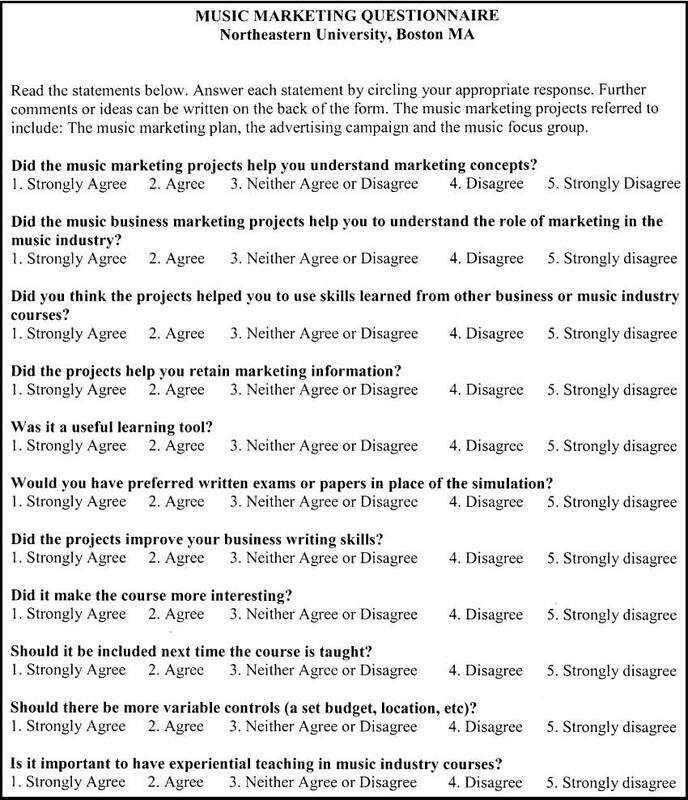 Students responded to a series of questions about the impact of the simulations on their understanding of music marketing using a five-point scale ranging from “strongly agree” to “strongly disagree.” These questions were linked to the objectives for the course and the simulations as a learning tool. For analytical purposes responses were coded from five (strongly agree) to one (strongly disagree). Higher scores on the scale indicated a higher degree of impact of the simulation on student learning. if the simulations helped them retain knowledge from the course. whether experiential teaching is important in music industry education. One other question was if they felt the simulations were a useful learning tool in comparison to more traditional teaching methods. Students were also given an opportunity to make comments on the simulations in general and offer their opinions on the management of the simulations. 4.36. Students stated that the simulations helped them retain marketing concepts (4.26) as well as apply what they had learned from other music industry and business courses (4.18). Students did not believe as strongly that the simulations were useful for improving writing skills (3.84). Many rely on writing-specific courses this purpose. 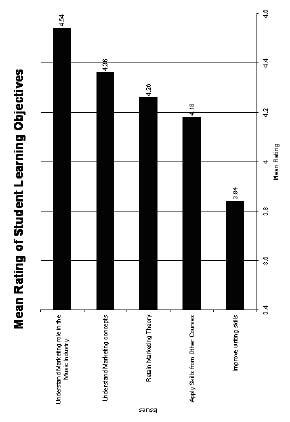 Overall, the mean ratings in general were relatively high, indicating a positive impact of the simulations on student learning outcomes. Figure 2 contains the mean ratings for questions that elicited student perceptions of the simulation process and experiential teaching in general. The highest mean rating occurred for the question regarding the impor-tance of experiential teaching in music industry courses (4.72). Two questions: if the simulation should be used next time the course is taught, and the use of simulations as a learning tool, earned a mean rating of 4.54. However, students were generally against controlling the variables of the simulations which scored a mean rating of 3.48. The only negative reaction to the survey was in regards to traditional methods of assessment. When asked if they would rather have tests or papers, students reacted with a mean rating of 2.03. Students also had an opportunity to offer written comments about the simulations. Many of the comments reinforced findings from the survey. Three students felt that the simulations would have run “smoothly if there had been more variable control.” Two suggested that each simulation should have a defined budget. Regarding the relative freedom of variables, three students felt that stricter “rules” would assist in creating the documents. Comments about how the simulation helped students learn and understand marketing principles were prevalent. All the students who made comments agreed that the simulations not only “made the class more meaningful,” but gave them a “better understanding of the material.” Additionally, they all stated the importance of “hands-on” learning in music industry education. Several lessons may be drawn from the simulations in this course. Student evaluations indicated that the simulation had a strong impact on learning and on meeting the course objectives. These findings are consistent with other studies (Boehlje and Eidman 1978; Drea, Tripp, and Stuenkel 2005). Furthermore, the survey indicated that students were more active in the learning process than if they had used traditional evaluation methods, such as examinations and papers. It also indicated that the students believe they retained the material taught in class. In addition, the survey reveals that the simulations not only helped students learn the material, but gave them what many consider to be lifelong skills beyond the area of marketing, such as time and organizational management and leadership skills. The seriousness of the comments indicates that students viewed the simulations as important methods of creating “real world” models rather than mere “game playing.” However, the results of the survey suggest that this was not an effective vehicle for developing writing skills. In fact, after extensive examination, Devries and Slavin found that although simulations increase academic performance, overall writing skills are not improved (Devries and Salvin 1976). Finally, the results of the survey suggest that the degree of student involvement had an influence on the perceptions of the effectiveness of simulations as a learning tool. The use of simulations as a pedagogical tool cannot be seen as a panacea for improving student learning and generating interest in this field. Several studies into simulation creation have produced contradictory and inconclusive findings of its effectiveness in learning (Smith and Boyer 1996, Wolfe 1985). A landmark study carried out by Randel et al. (1992) reviewed 68 studies comparing simulations with other instructional methods. His research indicated that 56% of the studies showed no difference between simulations and traditional pedagogical methods, 32% had better student performance using simulations and 5% favored traditional instruction. For a simulation to be successful, faculty must look at other areas of influence. A professor must convey, with enthusiasm and conviction, the value and importance of the simulation. Developing a simulation and getting students involved can be taxing, both on a professor’s time and energy. The degree of student involvement can be influenced through grading strategies. Most studies show that the higher the percentage of the grade devoted to the simulation, the higher the student participation (Anderson and Lawton 1992, Alpert 1993, Wolfe 1985). Non-grade incentives may also improve the degree of involvement with the simulation (e.g. encouraging competition, public display of the results, etc.). It should be mentioned that there are certain limitations to this study. First, this is an exploratory study into the role of simulations in music industry education. Due to the small sample size, no generalizations can be made on the use of this pedagogical technique as it applies to this academic discipline. However, the findings of the survey and research are consistent with many studies carried out in different fields (Taylor 1968; Deckinger, Brink, Katzenstein, and Primavera 1990; Drea, Tripp, and Stuenkel 2005). Second, this study only focused on one course. It is not known if similar results would occur if multiple simulations were conducted over several courses. Third, while the type of simulation used was appropriate for this course, it may not work in other situations. More research should be under-taken into the various methods of designing and implementing music industry simulations. Finally, the study does not show if students may have learned more from this method in comparison to other instructional methods, such as case studies, examinations, or written papers. According to research, most authors believe that simulations or gaming should complement, not replace, other methods of teaching and learning (Cruickshank and Telfer 2001). Although the survey indicated that students easily adapted to and embraced this technique, further investigation into the effectiveness of simulations compared to other instructional methods in music industry education is strongly encouraged. Allery, Lynne. “Educational Games and Structured Experiences.” Medical Teacher 26, no. 6 (2004): 504–505. Alpert, F. “Large-Scale Simulation in Marketing Education.” Journal of Marketing Education 15, no. 2 (1993): 30–35. Arora, R. and C. Stoner. “The Importance of Skill of M.B.A. Students Seeking Marketing Positions: An Employers’ Perspective.” Journal of Marketing Education 14, no. 2 (1992): 2–9. Becker, E. W. and M. Watts. “Teaching Tools: Teaching Methods in Undergraduate Economics.” Economic Inquiry 33 (1995): 692–700. Cadotte, E. R. “Business Simulations: The Next Step in Management.” Selections 54, no. 2 (1995): 8–16. Chonko, L. B., and M. J. Caballero. “Marketing Madness, or How Marketing Departments Think They’re in Two Places at Once When They’re Not Anywhere at All According to Some.” Journal of Marketing Education 13, no. 1 (1991): 14–25. Cruickshank, D. R. A First Book of Games and Simulations. Belmont, California: Wadsworth, 1977. Cruickshank, D. R. “The Notions of Simulations and Games: a Preliminary Enquiry.” Educational Technology (July 1972): 17–19. Deckinger, E. L., J. M. Brink, H. Katzenstein, and L. H. Primavera. “How Can Advertising Teachers Better Prepare Students for Entry-Level Advertising Agency Jobs?” Journal of Advertising Research 29, no. 6 (1989/1990): 37–46. Drea, John T., Carolyn Tripp, and Kathleen Stuenkel. “An Assessment of the Effectiveness of an In-Class Game On Marketing Students’ Perceptions and Learning Outcomes.” Marketing Education Review 15, no. 1 (2005): 25–33. Faria, A. J. and J. R. Dickinson. “Simulation Gaming for Sales Management Training.” Journal of Management Development 13, no. 1 (1994): 47–59. Johnson, D. W. and R. Johnson. Cooperation and Competition: Theory and Research. Edina, Minn.: Interaction Book Company, 1989. Laughlin, J. L. and R. E. Hite. “Game and Simulation Effectiveness in Marketing Education: An Experimental Investigation.” Journal of Marketing Education 15, no. 3 (1993): 39–46. Kolb, D. A. Experiential Learning: Experience as the Source of Learning and Development. Englewood Cliffs, New Jersey: Prentice Hall, 1984. Mariani, M. “Cooperative Education: Learn More, Earn More, Prepare for the Marketplace.” Selections 41, no. 1 (1997): 2–11. McKeachie, W. Teaching Tips: A Guidebook for the Beginning College Teacher. Lexington, Mass. : Health and Company, 1986. Scott, J. D and N. T. Frontezak. “Ad Executives Grade New Grads: The Final Exam that Counts.” Journal of Advertising Research 36, no. 2 (1996): 40–47. Stice, J. “Using Kolb’s Learning Cycle to Improve Student Learning.” Engineering Education 77, no. 5 (1987): 291–296. Taylor, J. L. “Observations on the Use of Gaming-Simulation Procedures in the Study of Social Systems.” Innovations and Experiments in University Teaching Methods Conference. Institute of Education, University of London, England (1968): 41–49. White, F. “Simulation of Agricultural Policy Formation as a Teaching Approach.” American Journal of Agricultural Economics (1977): 225–227. 1 Co-op, or cooperative education, is an educational model that allows students to take six-months of full-time employment related to their majors or interests while still an undergraduate. This usually takes place in the spring of a student’s sophomore year. A student who completes a typical full co-op program will intersperse three six-month co-ops with eight semesters of class. 2 For Northeastern University students who participate in the full cooperative education program, an undergraduate degree typically takes five years to complete (eight semesters of class and three six-month co-ops). The term middler is used to define the year between sophomore and junior years, hence the mid-point of the degree program. 3 The semester began with 49 students—seven groups of six, one with seven. With one student withdrawing mid-point in the semester, the course consisted of eight groups of six students. A native of Australia, RICHARD STRASSER is an Assistant Professor of Music Industry at Northeastern University. He is a graduate from the Canberra School of Music with a bachelor of music—with distinction in performance—and a graduate diploma in music. After winning both the Queen Elizabeth II Silver Jubilee Award and the prestigious Arts Council of Australia Scholarship, he continued his studies at the Manhattan School of Music, where he received the master of music and doctor of musical arts degrees. While at the Manhattan School of Music he was awarded the highly coveted Andres Segovia Award for exceptional performance in guitar. Strasser also has an arts administration degree from New York University.